Wool clothing stored in damp, warm, dim, or poorly circulated areas can easily attract mold and mildew. If permitted to grow, mold can cause considerable damage, sometimes completely ruining the wool clothing. Signs of mildew and mold in wool clothing include an unpleasant musty odor, discoloration, and sometimes holes in the fabric. Mold and mildew should be removed immediately from wool clothing, and preventative measures should be taken to protect your wool clothing from mold. Remove the moldy wool clothing from the house immediately and place it outdoors. Never try to clean moldy items in your house, as the mold spores can spread from the clothing to other objects in your home and cause further damage. Brush off any loose mold growth from the wool with a soft-bristled nylon brush. After the mold is brushed off of the wool clothing, leave the clothing outside in the sunlight for three hours. Sunlight kills mold and mildew. Soak the wool clothing in a bucket of cold water for one hour, and then rub a few drops of mild detergent on the moldy spots. Be sure to use rubber gloves when applying the detergent to the mold. Rinse the spots with water after applying the mild detergent to them. Lay the wood clothing flat on a board or table outside to completely dry. The clothing needs to lay flat to prevent it from stretching and losing its shape. The sunlight will kill any remaining mold left on the wool clothing. 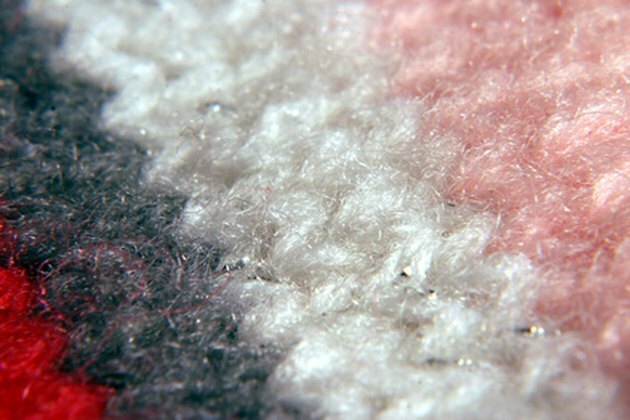 Never use chlorine bleach on wool clothing, as it can damage the wool.